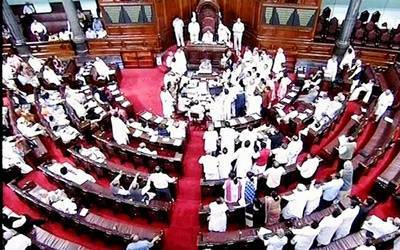 New Delhi, Dec 15 (IANS) The Lok Sabha was disrupted again on Thursday follow noisy exchanges between the opposition and the treasury benches over the AgustaWestland helicopter deal. As the house met, opposition members were noisily on their feet. Members of the Bharariya Janata Party flashed a newspaper clipper and also raised their voice. Speaker Sumitra Mahajan warned members against displaying papers in the house before adjourning the house till 12 noon. The house met again only to see more din.